WOTOFO SERPENT Mini RTA Atomizer 3ml is a member of the SERPENT series from WOTOFO company. The structure of the body is really succinct but effective, it can almost bring you the original taste of the e-juice. WOTOFO SERPENT Mini RTA Atomizer 3ml is a member of the SERPENT series from WOTOFO company. Compared to the former one serpent, SERPENT Mini RTA is more compact and easier to carry. The appearance of the package is really unique and attractive, it just looks like jeans. And what’s inside is beautiful and elegant as well. 3ml capacity is just fine for small size tank, the structure of the body is really succinct but effective, you will find that it is really easy to build the with single coil deck, so, it will be so convenient for you to clean. Besides, WOTOFO SERPENT Mini RTA can bring you great flavor as well thanks to the small size, it can almost bring you the original taste of the e-juice. 510 thread and 22mm diameter make it compatible with most of the 510 threaded batteries and mods without looking weird. 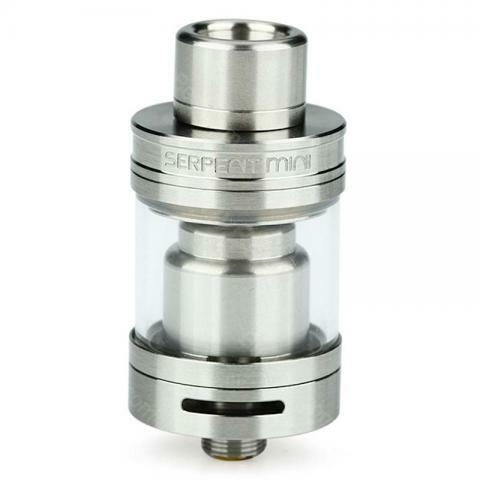 SERPENT Mini RTA Atomizer is a great choice for you if you enjoy DIY. 8. Set the juice fill cap on and enjoy vaping now. It comes fast, the complete sets are included. This tank is wonderful. It match well with my kit. NO flowing, no heating, everything is perfect. I just need to remove the top cap, then I can refill e-juice, so convenient. I can not love it any more! This is not the first time I order this seller. I advise the seller and the goods.It comes so quickly, and the quality is excellent.It is a very cool atomizer, with 22mm, with 3ml capacity, but it is fine for a small size tank.it is really effective with such compact size, amazing! Thanks for seller, I got great flavor from this tank, and I will buy again, I promise. I'm starting to learn building. My friend recommended me wotofo serpent RTA. Ease of use. and i love the taste. Love the flavor on my serpent mini RTA. Very nicely made RTA. My coil works just fantastic, I am such a genus lol!! !